Well there is no doubt about it, Final Fantasy XIV was a mess both technically and in design. It was heavily panned across the board and started the damaging slide of the brand, so much in fact Square Enix had to shut the game down and relaunch. 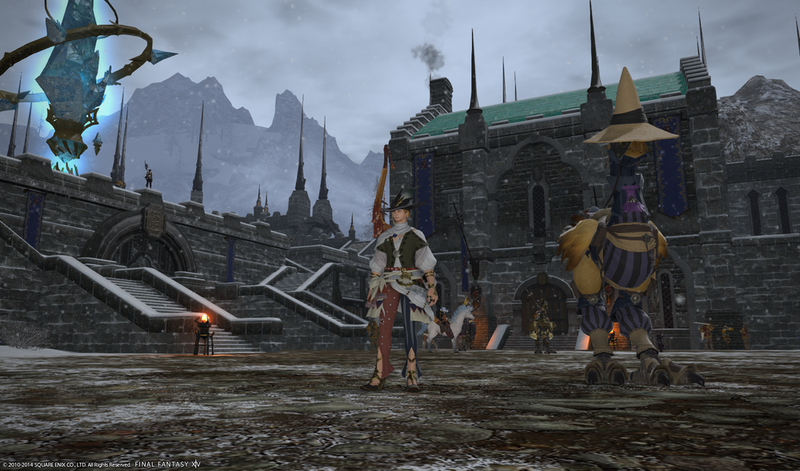 Under the new name Final Fantasy XIV: A Realm Reborn the game relaunched and now crossing it's third platform on the Playstation 4, nine months in since it's Playstation 3 and PC launch, it's time to see how this game still stands. A Realm Reborn picks up five years after the closing events of the original game, which you will see as the opening sequence of the game, the Heroes of Light (AKA the former players) have gone missing and you heed the call of the Crystal on your way to finding your adventure in a new home. This highlights one of what some people would consider the weakest element of the game, the game locks almost all content behind a story. As mentioned above this will certainly frustrate a lot of players, until level 10 of your selected class you cannot join another class guild in the same city and until level 15 to gain an Airship Pass to gain access to other parts of the world, making first impressions of the levelling experience painfully slow. Same is said with dungeons which must be completed once before any other progression in content is made. Thankfully once you push past level 15-20 you have access to all classes which you can freely switch to as you feel with the same character. This is the strongest element of the game as you are not forced to restart the game again, if for example you don't like the class you simply walk into a class guild and join keeping all progress in your other classes while you level and experience the new class. This system allows the storytelling 'wall' to be forgiven slightly as you only ever need to progress past the story once. From character creation you select from the eight the Combat classes in the game, as you progress through the guild's story you start to unlock more skills, however to begin with your chosen class may not be as fun as you expect due to the fact most skills run off a 2.5 second cooldown system. This makes the combat at first feel quite slow, this is by design to keep all players on an even footing in combat across platforms and regions, thankfully the game does use this fact to it's best giving all skills a sense weight and power when used. Once you cap out your class you will barely notice the timers as combat is very active and chaining your skills becomes important as many skills will become more powerful as a follow up to another skill then using it alone. When you start playing a second class you unlock the cross-class skill system allowing you to access skills from other classes to allow a fair bit of customisation with your class, however some skills are just the same skill renamed, so a little reading up is required. When you take a Combat class to level 30 you gain the ability to convert that class into a Job, these are specialised roles more suited to end game content. These require a second class to be at least levelled to 15 and also changes which cross-class skills you are allowed to use within that Job. The class system like most of the content hides it's better features away from you unless you are either told and just stumble into it, as classes and Jobs are weaker if used without them. That said once properly utilised it's a very good system and strong enough to encourage levelling multiple classes at once. Finally an armoury system helps you sort through your items by placing them in their own 'bag' as the inventory system doesn't expand past it's starting amount, which is quite large to begin with, combined with gear set system to help quickly swap classes from the hot bar. While levelling your class you are given a hunting log, these are optional kill quests marked above monsters with a target marker above them, much like quest mobs are highlighted. Unlike normal quests however you don't go to a NPC you just kill a set number to be rewarded with experience and Gil, competing the tier of the log will reward you with a greater amount before unlocking the next tier, providing you are at the correct level to do so. This is a good way to boost your levelling and most class quests do actually lead you into those areas with your hunt target mobs are. When out in the world you also get to experience the Full Active Time Event or FATE system. FATEs are live events happening in your location where a group objective much be met for rewards of Gil, Experience and sometimes loot, grouping is not required as long as you involve yourself in the task. FATEs do scale with the amount of players within them even add NPCs to help deal with the numbers at some points, however the FATEs can be outnumbered by players making them far too easy at points, but there are high ends FATES requiring a lot of players, but I'll get to them later. To help with your levelling experience outside of world content, or if you get bored of general questing the alternative is Levemates (or Leves for short). These are shorter personal quests on a timer, which have certain objectives which yield greater rewards. Quest mobs and objectives spawn in the world as normal however only you and people linking the same Levequest in your group can interact and attack things within the Levequest, this is good as it not only adds a bit more of a challenge given the time limit but also less stressful trying to find everything in time as everything belongs to you. Given that Leves are repeatable and fast the experience gain is greater then general questing these are limited, you gain 3 Leve 'points' per 12 hours with a maximum 100, Leves are not limited to Combat classes but Craft and Gathering classes too, I personally found Leves a great method to level those class types. Not far into the game you join a Grand Company, the large NPC faction guilds introduced in the main arc in which you must choose one of the three (although are able to change later on) introduce you to most of the side quests and optional dungeons within in the game. Also after joining you are given your Chocobo, this serves as both your first mount and from level 30 your battle pet. Your Chocobo gains experience like you do and each time it levels you are given points to spend in three stances you can select, tanking, healing, and DPS. There is an issue I'm experiencing with this system is that the Chocobo's exp gains don't really scale with your gains making levelling it quite slow at times. The Chocobo is an apt combat companion, but they do class as a player when it comes to grouping so not everyone will be able to use theirs all the time, but they cannot be taken into instanced content. Crafting and Gathering classes act like their own Combat classes in a way, each guild has it's own story to tell and you still progress as you would do with Combat classes with armour and 'weapons' of the class. Gathering classes open up nodes dependent on it's type when switched to, however seeing as you are in an active world not in combat armour you will in later areas be sneaking around in stealth trying to avoid combat at all costs, thankfully are nodes are personal to you so by time you do reach one it isn't taken from you by another player. Once you reach a node you are then presented with a window sightly confusing with numbers, what these numbers tell you are the changes of gaining the item in question and the chances of getting a high quality version of said item. At first none of these items will be shown to you directly and you still have to harvest the unknown item at a low chance, thankfully your skills at hand increase your rates of gathering and chances of a high quality item. This is also extended by the fact you have only four attempts at a node before you have to move on to start with however if you choose your skills when gathering said node correctly you will be to extend the attempts or even double the yield. Fishing works a little differently as it's nodes and contents are not directly displayed to you however most locations with water can be fished at, requiring it's own type of bait for optimal fishing. I've yet to experience this but also time is a factor as certain fish have different yield rates during different times of the day in game. All of this is tracked within their own logs detailing the level and zone location each item you have harvested is at. Fishing takes this one step further by adding each location's data you have fished at plus it's own lore and maximum size per fish you caught. Crafting itself seems a complex system however it's fairly straight forward when broken down, the main objective is to fill a progress bar in a set amount of turns. Progression is a combination of what skill you used plus your current armour and weapon skill numbers, added to that your skill has a chance to fail wasting one of your turns. Running the turn count down to zero before the progress bar is filled fails the creation of the item wasting all the items required to do so. Crafting also uses the cross-class skill system and correct use of the skills can extend the turns remaining and improve progression per turn, also using High Quality items within the crafting will increase the chances of the item being created becoming itself high quality, this can also be improved via skills but take up turns to do so. Crafting an item can end up using all crafting and gathering classes at many points making the system quite deep and requires you going back and two between classes and utilising mostly all basic crafts long part the level they were first used in. This makes it one of my favourite crafting systems in this current gen of MMORPGs and not the 'fire and forget' side system many games leave it as. Items in the game can be broken down into Materia, this in FFXIV is the gem system for socketed items. This is only happens when an item is Spiritbonded to you, this basically means you have to use the item a while before it can be converted into Materia, I like this system as it prevents the market from being flooded from players just grabbing everything off the market just to convert them. Finally once your character gains more levels in crafting classes they will be able to self repair their items instead of going to a repair NPC, but this costs a certain item to do so. Dungeoning as mentioned is a requirement while levelling to progress in the content and main story, this runs pretty much like the standard MMO fair with four other players. Once located all instance content can be accessed via a window called the Duty Finder this is the standard instance queue window however instead of selecting your preferred role you queue with what archtype your current class is deemed to be by the game. This can be a bit confusing for new players as until you actually try and queue for a dungeon what you assume is one type of class could be different to what you expect – Marauder and Arcanist are good examples of this Marauder doesn't seem a tank type to start with and Arcanist with it's heals isn't a healer type but is now classed as a DPS type due to resent patch changes. Guildhests work along side dungeons by teaching the basics of group play, these are micro dungeons with objectives these also go deeper into the combat system the higher the Guildhest level is. Finally and most importantly in the instance experience are the Primal battles, these are the single boss fights with the iconic summons from the Final Fantasy series. These can be pretty difficult fights which is not done correctly can lead to the party failing quite quickly. More so with your first Primal fight being at Level 20 in the form of Ifrit, which like Dungeons have to be completed once to progress with content. The Primals and the Dungeons do highlight a minor issue with difficulty spikes during the story content as certain dungeons do have complex bosses with a high failure rate if done incorrectly and each Primal if going in blind will kill you straight away if you aren't expecting an attack. This can lead to one or two frustrating moments but none I have seen so far has been deemed 'unfair' by the player base, despite a few latency issues that have lead to attacks hitting despite players avoiding the attack on screen, but these have been continued to be ironed out as the game goes on. Return to the realm in part 2 where I will cover the social aspects of the game via Free Companies, later stages of the game and how Square Enix intend to support it with content updates and finally how the cross platform systems work as well as my final thoughts.